President Moon Jae-in fulfilled his pledge to fill at least 30 percent of the Cabinet with female ministers as of Wednesday, with his nomination of ruling Democratic Party of Korea’s Rep. Kim Young-joo for labor minister. Currently, the new Cabinet has five female ministers and, if Kim is appointed, it would make 31.5 percent out of the 19 ministerial positions, including the Ministry of Patriots and Veterans Affairs, whose chief was recently upgraded to a ministerial level. Kim’s confirmation hearing is scheduled on Aug. 11. 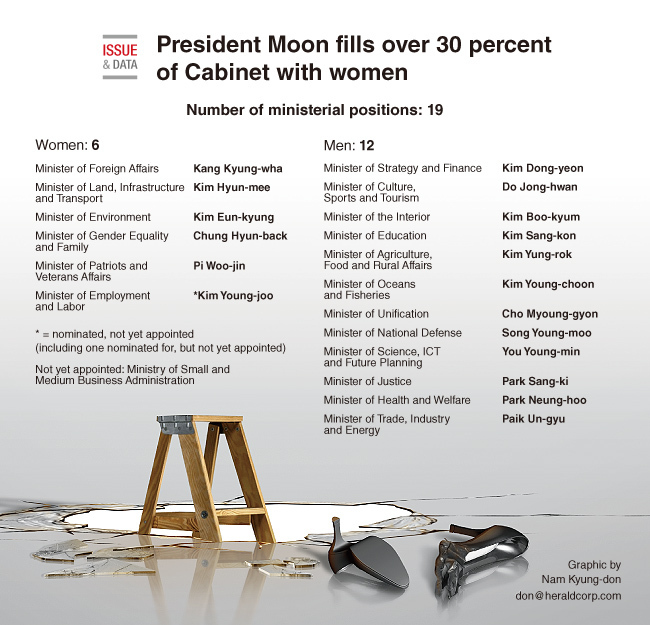 Moon’s attempt to promote balanced gender ratio in the Cabinet has been praised, and women taking traditionally male-dominated positions such as ministers of foreign affairs and veterans affairs has highlighted his efforts.